IRt/c infrared thermocouples are revolutionizing the printing industry because their small size allows them to be mounted in the tight spaces typical of both web and sheet fed presses, and their low cost allows economical installation and control on even the smallest of presses. Additionally, since many presses are already equipped with thermocouple controllers and PLC thermocouple inputs, the IRt/c is a simple installation. Applications include not only printing onto paper, but also cloth, plastic, and any other printing web application. On conventional presses (water/ink processes), the quality of the process is very dependent on the difference in surface tension between water and ink, and this surface tension is highly temperature sensitive. When presses operate, heat is generated due to friction in the pressing area. Heat build-up can significantly alter the surface tension of the water/ink resulting in a deterioration in print quality. 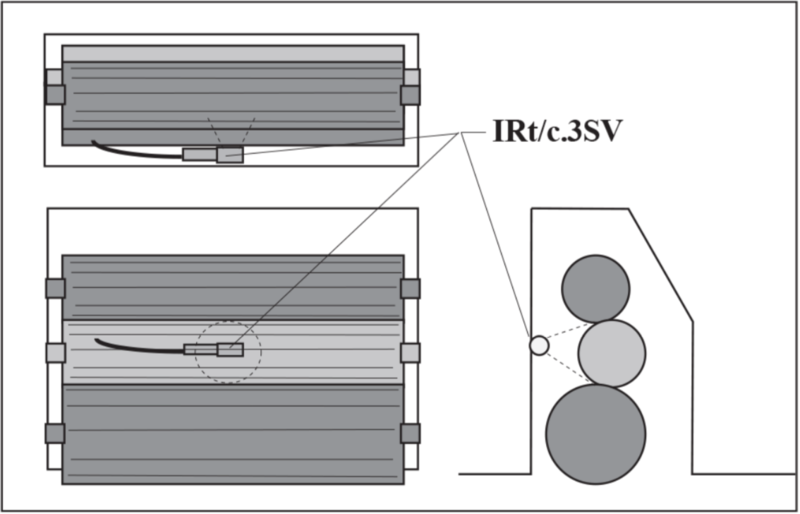 IRt/c sensors easily monitor any roll surface temperatures within presses. Connected to a display with alarm signal, they can alert the operator of deteriorating temperature conditions before poor quality impressions are made. Connected to a temperature controller, PLC or computer, the IRt/c quickly signals an installed press temperature control system to provide cooling to the press area, or signal cooling systems to provide cooling to the ink and/or water supplies to maintain proper surface tension. Temperature is also important when there is risk of thin wall cylindrical platen(s) becoming loose or sloppy due to thermal expansion (or contraction). On large diameter metal cylinders, a small temperature change can result in a significant change in the circumference of the roll, and thus affect the proper “fit.” By measuring the surface temperature of the roll, the proper fit of the plate can be maintained by either (1) cooling the area or (2) slowing down the press so friction heat decreases to a low enough level to maintain print quality. “Waterless” ink technology involves the use of special inks to eliminate the need for the water/ink combination. This technology has significant cost and performance advantages for the printer in elimination of waste treatment, and higher quality product. The waterless ink technology can be applied to virtually all types (web and sheet fed) and sizes of presses from large multi-color presses down to the small presses. Conventional presses can be converted to use these inks by providing a method to control the surface temperature of the rolls where the ink is applied to the platens. This is typically done by using hollow rolls and supplying chilled water through the rolls to keep the surface at a desired temperature. The IRt/c is a key component of the package required to convert a press, since waterless inks are very temperature sensitive and must be applied with strict ink and surface temperature control. The surface temperatures are easily monitored by an IRt/c. The output signal is sent to a discrete temperature controller, PLC, or custom computer control system to regulate the refrigerated circulators providing cooling water. The IRt/c sensing system is precise enough to also allow manipulation of color characteristics for waterless printing. For example, running a particular waterless ink at different temperature extremes allows for choosing between brilliant or softer colors. After ink is applied to the paper (or cloth, plastic, etc.) in the printing area, the web (or sheet) typically travels through a drying/curing process. IRt/c sensors are used where they (1) “look” directly at the web or sheet while it is inside the dryer or (2) at the web just as it exits the dryer. Either method can be used to control drying temperature or UV curing. For web presses, a much more accurate way is also possible. By using multiple IRt/c sensors along the web while in the dryer, the actual “Dry-Out” point can be located and controlled within the dryer. See Tech Note #67. For web offset printing, as the web leaves the dryer, it runs through a chill roller(s) to cool the web so that the paper (cloth, plastic, etc.) can be cut and stacked, or rolled, without the material sticking together. By using IRt/c sensors to measure the surface temperature of the web at the point where it is being chilled, the IRt/c signal can control the amount of chilling. This control will eliminate “over chilling” (condensation problems due to high ambient humidity common in press rooms) and “underchilling” problems, automatically. Hot melt glue guns and applicators periodically “plug up” or run out of glue. Properly used IRt/c sensors or an Exergen AAM system can instantly alert machine operators prior to products being glued improperly. See Tech Note #18 and/or the section on the Exergen AAM Series (Applied Adhesive Monitors) in The IRt/c Book.